"Brand Ambassador of Graduate Studies 2019". The application is available from now – the 19 of January 2019. "Grab your chance to improve yourself and our university"
Please read the "Project information" for applicants' qualification and project schedule. 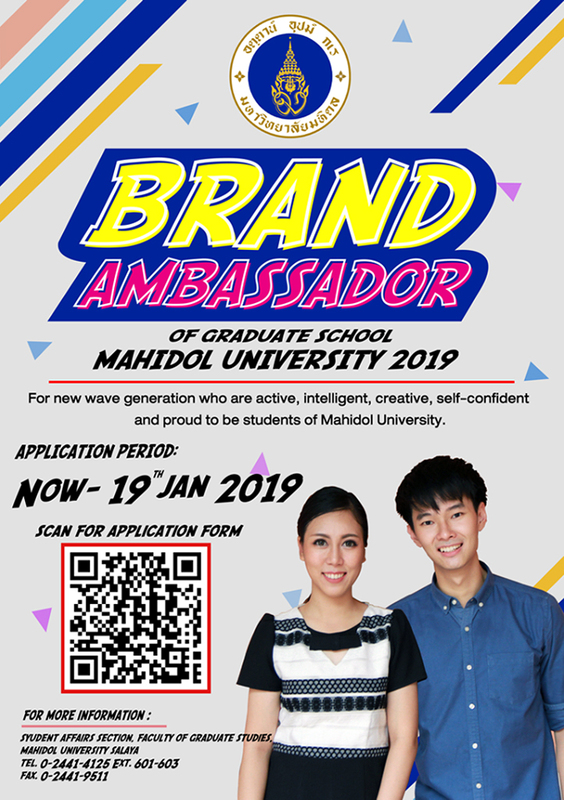 The applicants must be presently the postgraduate students at Mahidol University. issues to work as the Brand Ambassadors of Graduate Studies. The applicants must have no health issues to attend the Brand Ambassadors activities. The applicants must be able to demonstrate English language skills. Preparation: two formal clothes, white shirt and blue shirt for popular votes photos. 2001- 2010, Faculty of Graduate Studies, Mahidol University. All rights reserved.